The random weather in LA has left me constantly unsure about which portion of my closet I need to consider when getting dressed. Rainy one moment, sunny the next, gusts of wind in between. Shoes are a more confusing ordeal. Thus, pulled out a scarf I havent worn in a while with a rather forgotten neon tank. I can't believe I'll be done with the school year... as soon as I finish up my last two finals. Then off the NYC! I'm just completely bummed that weather.com shows no prospect of any sun while I'm there. All rain and t-showers. I'll have to adjust my plans for continuous ambling. After studying, went to My House in Hollywood for a graduation party. Good times. Congrats Jess! 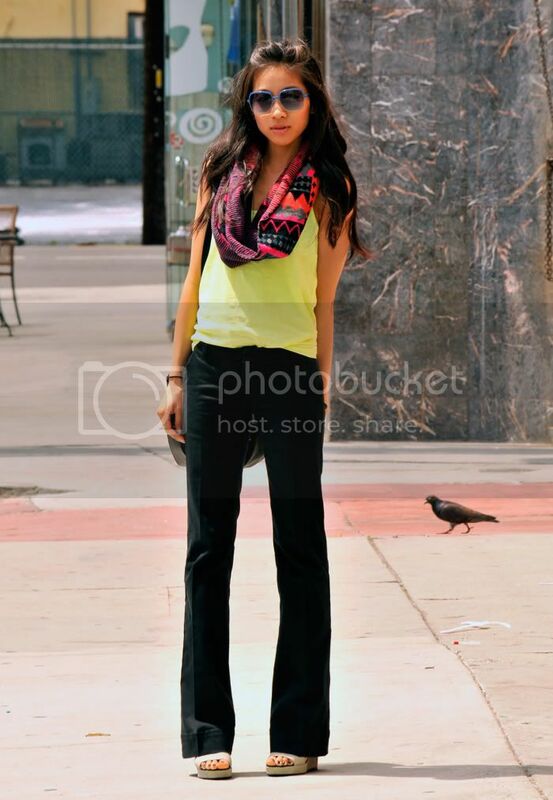 Love the bright top and scarf! love your sunglasses and how you matched them with bright top! great color mix! !